Hi friends, Now a days Paytm cash is offering many product packs. So here is another one, You can earn Free Rs.15 Paytm voucher with Paytm Krack jack pack and you can grab these products from Nearest store. 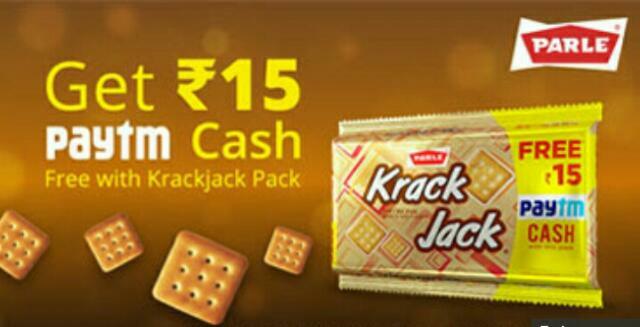 This time Paytm offering Free Paytm voucher of Rs.15 with Krack jack Pack Worth Rs.25. Now just follow the below steps to get this paytm offer. – This Offer is being conducted by Parle Biscuits Pvt. Ltd./ Parle Products Pvt. Ltd. (herein after referred to as ‘Parle’) in association with One97 Communications Ltd. (‘One97’ or Paytm’, collectively referred to as ‘the Organizer’) on One97’s platform, namely www.Paytm.com (‘website’). – This Offer is valid in India from 15th March 2017 to 15th September 2017 (‘Offer Period’) on purchase of Krackjack Packs referred to as “Products” and on limited stocks only. – User would not be able to avail the offer after that, even if the product is available and within the product shelf life as mentioned on the individual packet itself. – The promo code cannot be redeemed after the expiry of the Offer Period and you agree to waive off right of redemption on the date of expiry of the Offer Period.